Barb In Moldova: Whoosh! There it went! Three weeks - gone. But oh how precious they were, mostly because of the time I had with my family: Marah and Alejandro, Josh, Ben, Mom and then at my niece's wedding weekend I got to see many other relatives and even snuck in a sister-to-sister breakfast on the morning of the wedding day with my one and only sweet sister, Beverly (also known as MOB - Mother of the Bride - that weekend. ) She was a beautiful bride (and yes this is the one with the proposal on the chocolate cake - see blog of earlier this year). And yes, the wedding cake was chocolate, of course. I can't even begin to tell you how wonderful it was to have dear friends take care of every aspect of my visit - luxury accomodations with the Hetheringtons and then a whole house to ourselves at the Kays. 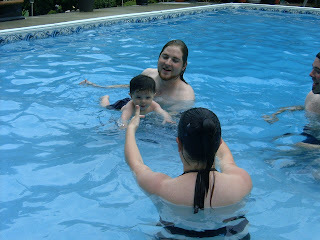 I had transportation my whole time in Toronto to tout Marah and the baby around to all the many, many places we went. Inga's car was red like mine (and stick-shift) so I could easily find it in a parking lot, and Kathy's van was plenty big enough to transport my whole crew easily. We visited more people than I had intended but fewer than I would have liked. Marah's best friend had a baby the day I arrived so it was fun to visit her in the hospital and later to see Marah together with several friends who are in this new and wonderful stage of life: parenting. And me - I'm a grandparent. Grandma. That's me. Able to make up silly songs at the drop of a hat and willing to babysit whenever the opportunity arises. Eager to buy whatever Ali needs or wants and can't wait to read him the new books and see him play with the new toys. Ali is a wonderful little boy - well, not so little, quite a hefty guy - with a sweet personality. Everyone fell in love with him. Really! it wasn't just me. Ask Heather or Karen or Jane or better yet, ask his uncle Ben. 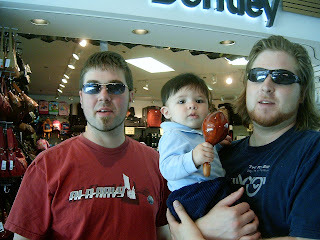 Uncle Josh has had the advantage of living close enough to visit regularly and is familiar and fun to be with for Ali J. But Ben had to make the most of his opportunity to endear himself to his sweet nephew. This appeared to be a great pleasure to him and it was so fun watching all my babies delight in this baby of Marah's. He is blessed and a blessing. Dan, I'm just so sorry you weren't able to come with Marah but thank you for letting us enjoy her and Alejandro so much for these weeks. 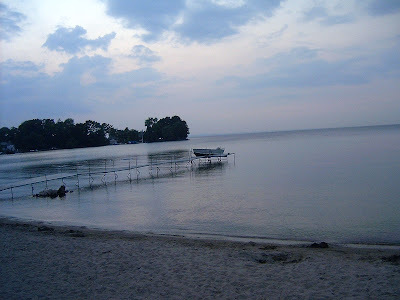 One of the joys of my time in Canada was the several opportunities I had to go swimming. In my cousin's pool, in the MacDonalds' pool and at Mary Lake visiting the Johnsons, we thoroughly enjoyed getting wet and taking the baby in the water too. Another of my pleasures was going to movie theatres, a favourite pastime that I really miss in Moldova. I stocked up on DVD's and have decided I'm going to save up my banutsii (Moldovan coins) to buy a DVD player for our apartment. What else do missionaries do when they go home on vacation? Well, aside from doctor and dentist appointments and visiting friends and family, that is. I ate all the foods I had craved for over the last 9 months - KFC, Tim Horton's, Circle Thai, Swiss Chalet, Second Cup, Red Lobster, Jack Astor's, salad, Greek food, fast food, home-made food, rich food, lots of unnecessary food but best of all, food in company with people I love. It was rich in many ways. It was a privilege to visit my home church and participate in a worship service, as well as lead an evening Bible study - and what a joy to see so many loving and friendly faces of people who support and pray for me. Thank you so much for making it even more clear how loved and blessed I am! I was especially moved to see the mission display board in the Sunday School featuring some of our work here in Moldova (Day Centres for children) as the mission project and regular updates of my newsletters posted. At the tail end of my time I spent a few days with all my Canadian Baptist missionary friends at a staff retreat. That was a bit more relaxing than the rest of my time and I'm afraid I was a bit of a recluse but sometimes we just need... ok, I, just need to be alone. At the end of that I topped off my stay with a day and a half visiting my mother, who at 88 is always keen to do something or go somewhere. 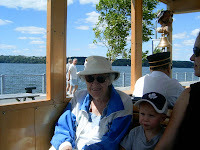 We enjoyed a lovely harbourfront tour on an old-fashioned trolley bus on a beautiful day. So now here I am back in Moldova - and it is HOT HOT HOT! Getting off the plane was like walking into a sauna with temps in the high 30's and even in the 40's this past week. Tomorrow the temperature is supposed to go down into the 20's but I am ever so grateful for the fact that we have been blessed with air-conditioning in my apartment. Otherwise, I would be non-functional. As it is, the heat and the jet lag make a challenging combination and up to now I have been feeling less than productive. At the same time, most of the people I know do not have air-conditioning and some don't even have a fan and it has been very difficult for them to sleep. Worse than that, though, is that Moldova is desperately in need of rain. Already crops are less productive than needed and people are worrying about lack of food this coming winter. Will you please pray for Moldova, and specifically for rain? Posted by Barb at 11:42 p.m.
Barb, I am so sorry that I missed you while you were here in Canada but it sounds as though you had a marvelous time and so I praise God for your trip and your safe return! You are a precious woman Barb Fuller and I miss you.